Study participants must be 6- to 9-years-old. 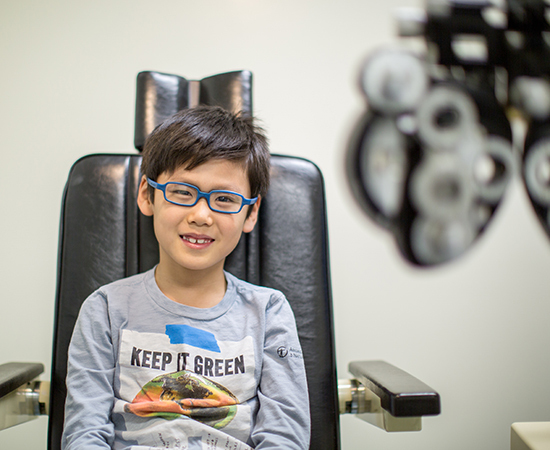 NEW YORK, January 10, 2019 — SUNY Optometry and SightGlass Vision, Inc. will conduct a clinical trial for FDA approval of glasses designed to correct myopia, or nearsightedness, and reduce the rate of myopic progression in children ages 6- to 9-years-old. Clinical trial participants must be 6- to 9-years-old. The trial involves using study glasses for up to three years. Participants will be able to choose from a variety of frames and use one of three types of lenses instead of their normal glasses. The glasses will be provided at no cost and participants will be offered a small reimbursement for their time and travel expenses. “Currently available glasses in the United States only correct myopia, but do not help prevent it from getting worse,” Dr. Fry said. Prospective participants will be assessed by a research optometrist and, if suitable, be invited to attend up to 14 visits over three years at SUNY Optometry’s midtown Manhattan location across from Bryant Park. Participants will also receive comprehensive eye care at no cost for the duration of the study. Parents who are interested in having their 6- to 9-year-old nearsighted child participate in this clinical trial may contact Monica Joao, Clinical Research Coordinator, (212) 938-4052. Founded in 1971 and located in New York City, the State University of New York College of Optometry is a leader in education, research and patient care, offering the Doctor of Optometry degree as well as MS and PhD degrees in vision science. The College conducts a robust program of basic, translational and clinical research and has 65 affiliated clinical training sites. SUNY Optometry is regionally accredited by the Commission on Higher Education of the Middle States Association of Colleges and Secondary Schools; its four-year professional degree program and residency programs are accredited by the Accreditation Council on Optometric Education of the American Optometric Association. All classrooms, research facilities and the University Eye Center, which is one of the largest optometric outpatient facilities in the nation, are located on 42nd Street between Fifth and Sixth Avenues in midtown Manhattan. Disclaimer: This press release contains “forward-looking information”, including “future oriented financial information” and “financial outlook”, under applicable securities laws (collectively referred to herein as forward-looking statements). Except for statements of historical fact, information contained herein constitutes forward-looking statements and includes, but is not limited to, the (i) projected financial performance of the Company; (ii) completion of, and the use of proceeds from, the sale of the shares being offered hereunder; (iii) the expected development of the Company’s business, projects and joint ventures; (iv) execution of the Company’s vision and growth strategy, including with respect to future M&A activity and global growth; (v) sources and availability of third-party financing for the Company’s projects; (vi) completion of the Company’s projects that are currently underway, in development or otherwise under consideration; and (vi) future liquidity, working capital, and capital requirements. Forward-looking statements are provided to allow potential investors the opportunity to understand management’s beliefs and opinions in respect of the future so that they may use such beliefs and opinions as one factor in evaluating an investment. These statements do not guarantee future performance and undue reliance should not be placed on them. Such forward-looking statements necessarily involve known and unknown risks and uncertainties, which may cause actual performance and financial results in future periods to differ materially from any projections of future performance or result expressed or implied by such forward-looking statements. Although forward-looking statements contained in this press release are based upon what management of the Company believes are reasonable assumptions, there can be no assurance that forward-looking statements will prove to be accurate, as actual results and future events could differ materially from those anticipated in such statements. The Company undertakes no obligation to update forward-looking statements if circumstances or management’s estimates or opinions should change except as required by applicable securities laws. The reader is cautioned not to place undue reliance on forward-looking statements.